By default Windows will have a few of the more commonly used programs and locations on your computer to send a file or folder to when choosing the Send to option in the right-click menu. However, if you want even more locations to send a file or folder hold down the Shift key when right-clicking the file or folder to get additional options. As seen in the picture below, all folders after the DVD DRW (D:) are new folders that will appear when holding down the Shift key. 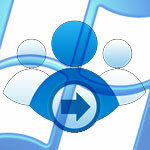 tips microsoft windows, tips, Windows. permalink.